The rapidly changing Australian demographic requires an understanding the challenges ahead in order to ensure a sustainable health economy. Our key focus areas of research mirror the changing demographics, with an emphasis on quantifying value, in terms of performance and cost. The primary objective of MUCHE is to produce research that contributes to public debate. This includes working closely with government and non government organisations to facilitate better informed decisions on policy and resource decisions related to health and human services. In addition to the Centre's collaboration with the Faculty of Business and Economics and the Faculty of Human Services, MUCHE is complemented by a number of recent investments in health research and service delivery by the University. · The relocation of the Australian Institute of Health Innovation. 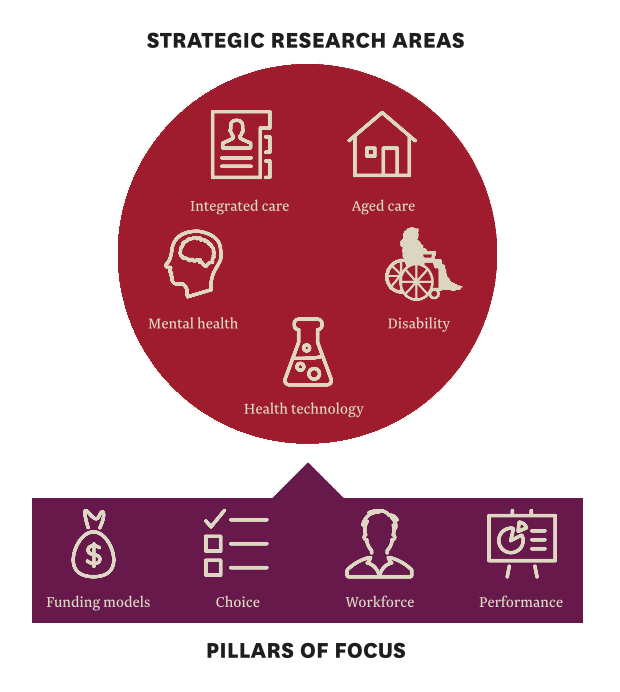 The Centre's strategic research areas include Integrated Care, Aged Care, Disability, Health Technology and Mental Health. Currently our work falls within four main areas of study: Funding Models, Choice, Workforce and Performance as shown left.